I spend May through November avoiding baking with chocolate, because I want to be able to take advantage of the berries, then the stone fruit and finally the apples and pears of Fall before I start reintroducing everyone’s favorite flavor back into my baked goods. Now that it’s the season of cookies, I want to share with you the perfect cookie with the perfect name to celebrate chocolate. For many of you, Dorie Greenspan’s World Peace (or Korova) Cookie is nothing new. In fact, it’s so very 2007, isn’t it? It may already be on you list of go-to recipes. It may be that small, crumbly coin that comforts you after a bad day. Nevertheless, it’s the perfect treat to gift or to bring to a Christmas cookie swap. 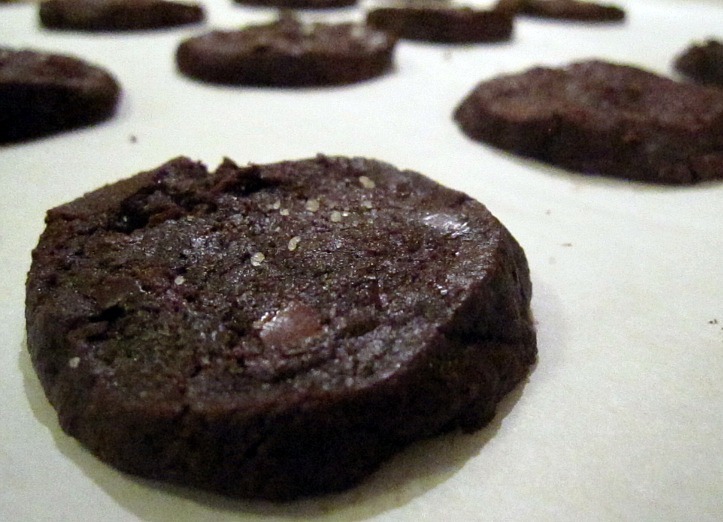 As a sablé, the cookie has a sandy texture between the teeth, but the rich base is interrupted by shiny pools of bittersweet chocolate. 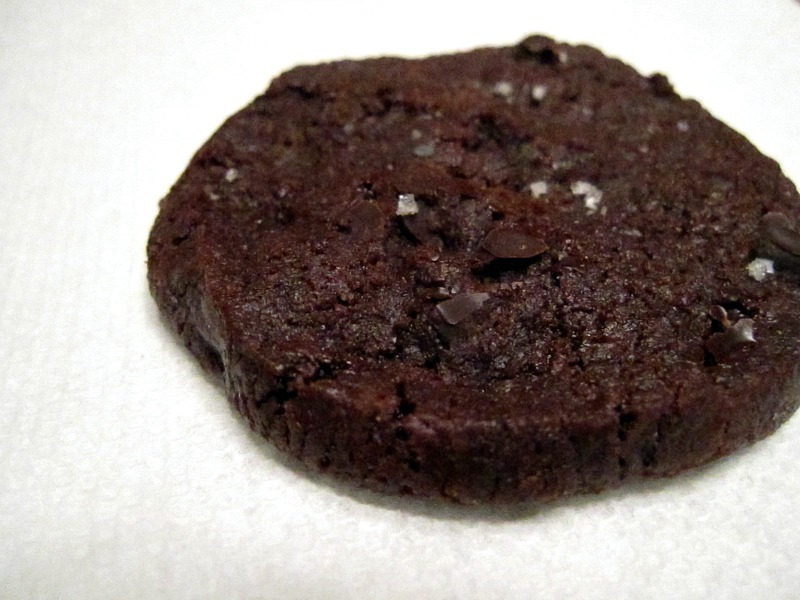 The addition of fleur de sel in the batter makes the cookie and proves that salted desserts are timeless, not trendy. I can even handle a bit more than the written ½ tsp, and I festively sprinkle some of the tops. This is a place to bring out the big guns. I won’t name drop chocolate brands, but you know which are the richest, and they belong here. I don’t use my freezer very much, but I sometimes store a log of these cookies to slice and bake when I’m feeling a little bit cynical. These cookies might not bring world peace, but they conjure up a sort of inner peace when they reach my lips. Don’t we all need some of that during the holidays? Turn off the mixer. Pour in the flour mixture, drape a kitchen towel over the stand mixer to protect yourself and your kitchen from flying flour and pulse the mixer at low speed about 5 times, a second or two each time. Take a peek — if there is still a lot of flour on the surface of the dough, pulse a couple of times more; if not, remove the towel. Continuing at low speed, mix for about 30 seconds more, just until the flour disappears into the dough — for the best texture, work the dough as little as possible once the flour is added, and don’t be concerned if the dough looks a little crumbly. Toss in the chocolate pieces and mix only to incorporate. Using a sharp thin knife, slice the logs into rounds that are 1/2 inch thick. (The rounds are likely to crack as you’re cutting them — don’t be concerned, just squeeze the bits back onto each cookie.) Arrange the rounds on the baking sheets, leaving about one inch between them. Do ahead: Packed airtight, cookies will keep at room temperature for up to 3 days; they can be frozen for up to 2 months. They can also be frozen in log form for months, and can be sliced and baked directly from the freezer, adding a couple minutes to the baking time. I just watched the DVD with the Test Kitchen’s episode where they make sables and was feeling a little inspired to do so myself. Love the addition of salt and I agree that it is timeless, not trendy. Now to create my holiday baking plan of attack…. I actually have not made these, but every time I see them, I want to make them. Don’t know what I am waiting for!